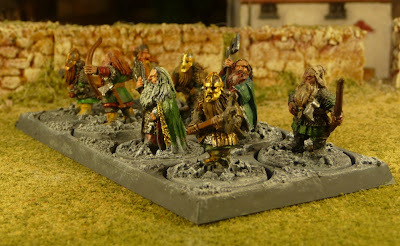 A very short post to show off my son's Dwarves from his LotR collection. These are from the Khazad Guard collection and I think the chap in green (second from the right) is a Dwarf king of some sort. After looking at Nicolas's Nowhere to Lead Soldiers collection one really has to be impressed with the Games Workshop's LotR Dwarf figures, they really are superb. I also love dwarfs figures from GW. They were sculpted by Perry' brothers I think !? Very fine dwarves. Yes, thats a King figure.